The KLAPA container is a great space saving solution as it can be folded down when not in use. | George Utz Ltd. 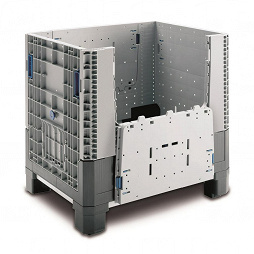 The KLAPA 800x600x770mm is a foldable plastic pallet container. A folding of the side walls allows a considerable space saving. The container has 4 feet and has a reinforcement of the side walls.This makes it particularly sturdy and can be stacked over the edge as well as over the lid.